Discover the city of Leiden! Enjoy an unforgettable drive it yourself trip through the historical city Leiden. Leiden is home to the oldest university of the Netherlands, and is famous for its rich history and old city centre. During this tour in a 100% electric Renault Twizy with GPS navigation, many of the historical sites will be shown which appear to have withstood the passing of time. Be surprised by what a buzzing town like Leiden still has to offer with its 17th century city centre! Start and end point of this tour is Lisse. Before you arrive in the city centre of Leiden, you first drive a twenty-minute ride through the famous dune and bulb area with its typical Dutch landscape and picturesque villages. Enjoy the ride! 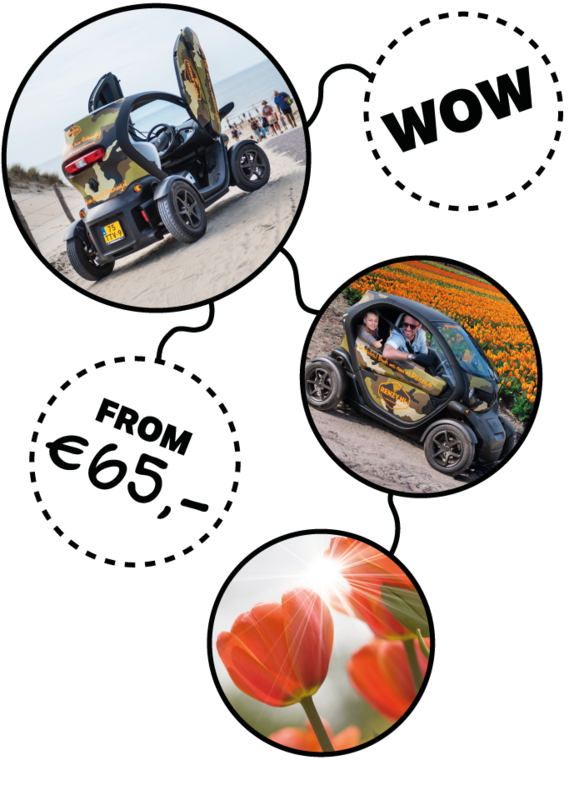 € 85,- for a 180 minutes GPS tour in 1 Renault Twizy, suitable for 2 people. The Leiden City Tour is available from 19 May to 31 October. We are open 7 days a week and we offer 2 departure times per day for this tour. "Really great to visit an historical city which appear to have withstood the passing of time. Highly recommended!"